In 2006, I acquired a Parkville Pen Special Edition Submariner Grande in chocolate ebonite. I also happen to own two non-standard models – a submariner grande in “blue lightning” (a medium blue with white lines) and a granite coloured flat top, very similar to its Classique model and reminiscent of a Parker Duofold. One of my current favourites, released by Bexley in the spring of 2007, is the Poseidon. I own the gorgeous translucent tortoise model – black with black and tortoise highlights. It reminds me of a jumbo Pelikan 100N. And yes, it has a broad stub nib! I will try and get some pictures of these pens. I am fortunate to own a number of Bexley pens. Bexley is an American company that was founded in the 1990s by a number of fountain pen enthusiasts, chief among them the founder, Howard Levy. The company started out by making classic designs in traditional materials and colours (such as ebonite and mandarin yellow and orange, for example). Over the past few years, it has started to issue an Owner’s Club limited edition pen (or two) each year that is first made available to current Bexley owners and then the public. Mr. Levy is also famous for showing up at pen shows with small numbers of non-standard production models – different colours and/or materials – some in numbered editions and others as unmarked “prototypes” (or selling them through an Ebay seller by the name of outletline). Bexley pens sell in a number of different price ranges, offering a variety of colours and nibs and thus serving a wide range of customers. It is rare to hear a complaint about the quality of a Bexley pen, especially their nibs, which are universally held in high regard (and I believe are manufactured by Peter Bock AG). One of their most popular nibs is an unusual broad stub nib that is about 1.3 mm wide. In fact, the broad stub is one of my personal favourites – while I have a variety of nib sizes in my Bexley, the broad stub outnumbers the rest by far!! I am not going to review each and every Bexley that I own, rather their pictures are posted below and I will make the occasional comment on them. The first one of note is Bexley’s 10th Anniversary pen; the available colours are shown below – I own one of the red ebonite models. Next up is the 2005 Parkville Pen Limited Edition in Jungle Green – I own #06/25. As I mentioned before, Bexley began an Owner’s Club limited edition program for Bexley owners, starting in 2006. Of particular note about this pen is that it uses a vacumatic filling system! Two choices were available – amber (very nice) but I went with the silver. A handwritten note is such a simple yet elegant gift. The connection between the pen and your soul. The feel of the ink as it flows onto the paper. The unique beauty of the pen. An incredible choice of inks and paper – an endless possibility for visual expression. I take my time and reflect upon the words that I choose. Memories – using the same pen as a parent or grandparent; remembering them and thinking of them using the pen. The ritual of filling the pen from a bottle of ink. A connection to the past, when life was simpler. I shall close this post with a few of my favourite quotes. The grace and attractiveness of desk sets added this autumn to the holiday madness through which fountain pen manufacturers pass at the end of each year. For some reason the retail sellers of the pens & pencils always underestimate their holiday trade. Stocks run low; telegrams and long distance telephone talks beg for shipments. Out of last week’s pandemonium boomed a happy note from Fort Madison, Iowa, headquarters of the W. A. Sheaffer Pen Co. Walter A. Sheaffer, now 61 years old, had been a prosperous jeweler there 15 years ago. In all merchants prosperity and alertness are not concomitants. In Mr. Sheaffer they were. He organized his fountain pen company; hired skilled salesmen, skilled advertisement writers. They wrought as he expected. Last spring the 9,734 shares in the company were each worth $100. Last week a buyer was obliged to pay $852 for a share, and Mr. Sheaffer sent word to stockholders that they had best assemble in Fort Madison at once to change their capitalization from the 9,734 shares to 20 times that amount (194,680). The change is to distribute their vast profits in a thinner, more seemly layer. Read the full text of the article, which briefly traces the history of writing from an ancient man with a piece of chipped flint to the invention of hard rubber “eyedropper” pens by Lewis E. Waterman, at Fountain Pens. A Few Interesting Pens from Parafernalia – What Else Did You Expect? I am not really a ballpen person anymore. It’s almost always a fountain pen for me, but, there are those times when I have to fill out a form in duplicate, etc. so I am forced to use a ballpen (I try a rollerball, if at all possible). Most people are familiar with Parafernalia‘s best known pen, the Revolution. These very clever people have developed some new, equally revolutionary designs – the FALTER 2D which is not only a pen in an assembly kit but also a ruler and a pen holder. The pen is constructed in four easy steps and the PATENT 1 which is derived from the on the simplification of the mechanisms of insertion and extraction of the refill. If you are interested in cool and innovative design, check out these and the many other pens (like the Clipper – which is now available in a transparent limited edition (the Clipper Soft Touch) that comes in white, grey, and orange so that you can see its internal mechanism (think demonstrator fountain pen)) on their homepage. Nice little ditty on the importance of fountain pens and your memory. If there is anyone on this earth who deserves our support (all year round) it is the brave women and men of our Canadian Forces. Help them out any way that you can. Please. Yes, we have another A – Aurora; however, the actual name of the company established in Turin in 1919 was Fabbrica Italiana de Penne a Serbatoio. The original Aurora 88 was launched in 1947. Nicknamed the “Glorious 88”, it had a hooded nib similar to the Parker 51. The current model (that I own) has an open nib. My 88 is the large glossy black Ottantoto model (pictured above) with nikargenta (an alloy of silver and nickel) trim. The nib is a medium italic in 14k. Piston filler. Dimensions are 135 mm (just under 5 1/2 in.) capped and 158 mm (6 1/4 in.) posted. The diameter of the barrel is about 10 mm at the end, 14 mm around the middle. If I had to go on a desert island and take only a handful of pens, this would be one, without a doubt. The pen is a classic, understated design. It holds a ton of ink and it is a magnificent pen to write with – well-balanced and giving my writing just the right amount of line variation that I expect from an italic nib. Now, I have heard rumours that Aurora nibs are toothy; maybe I am lucky but I don’t feel it. The Optima was released around 1992 and has a streamlined design, similar to pens released by Aurora in the 1930s such as their Duplex model, and accented by a wide Greek key deco cap band. The celluloid material called auroloide is just stunning, giving amazing depth to the various colours (blue, green and red). The pen also has a really cool imprint and plain black flattop, just like a vintage Duofold Lucky Curve. The pen is very similar in size to the 88, perhaps a bit shorter and fatter. It is the exact opposite of the 88 in terms of overall design – where the 88 is understated, the Optima is luxurious. I have the blue one and it has to be one of the most beautiful pens that I own, if not the most beautiful. When I open the drawer that it is stored in, along with another 25 or so pens, it immediately catches your eye. The marbling of the blue, the gold geometric cap band, 18k gold nib and retro look and feel is something to behold. In fact, I love this pen so much I have not even written with it! Oh yeah, it has a medium nib. Before I bought the blue auroloide, I looked carefully at the red and the green. The red is very nice (just not my colour – although look at the Perla below) but the green is just as spectacular as the blue. I had a very tough time picking between the green and blue. After many attempts, I have finally secured a Pelikan 100N on Ebay. I have not received it yet but if it is anything close to the photos (below) then it is a beauty – and a bargain for $125! I am particularly pleased that I was able to obtain the less common model with the fluted clip and milled cap band. According to the item description, the pen was made in 1954; this means it was made in the last year of production. What a classic pen! Here are the pictures and then a bit of history of the Pelikan 100 and 100N. 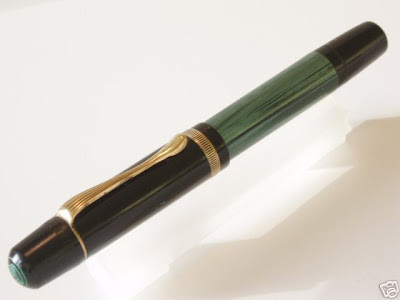 A year after its introduction, ‘The Pelikan Pen’ was modified slightly and became known as the ‘100’. The most visible difference was the cap, which grew two cap bands, and the nib, which lost its heart-shaped pierce hole in favour of a circular one. The barrel became celluloid instead of bakerlite (sic) and a new shade of green was added to the range. Further modifications were made in 1931, most notably the top of the cap which became slightly more tapered, and further colours were added. Even more colours followed in 1935 to include marbled pens, tortoiseshell andlizardskin. These became known as the Model 101. These coloured pens are hard to find nowadays as many were destroyed during the war. Of special interest was a de luxe range introduced in 1931. The 110 had a cap and barrel of white gold. The 111 with a black cap and 14ct gold barrel, and the 112 with a 14ct gold cap and barrel. And, most significantly, the T111 known as the Toledo with a 22/24ct tooled barrel. Production of the 100 series ended in 1944. In 1937 a new model went into production, known as the 100N (N for ‘new’). Although similar in shape to the 100, this was a bigger pen, both in length and diameter, which consequently had a larger ink capacity. The other main visible difference was the filling knob, which was more conical and now smooth as opposed to the ribbed knob on the 100. Versions of this model can also be found with a shorter cap top. These were intended as export models to countries where, it is reported, fashion dictated that a flap on the top of a jacket pocket would fold better if the pen did not stick up too far. The cap rings came in two versions – a double ring or a broad, fluted decorative ring with matching fluted clip. Because of the war and subsequent gold shortage, gold nibs were not allowed, so pens made during wartime had palladium nibs. Later in 1939 palladium was also forbidden and nibs were made of chrome, nickle (sic) and steel. In 1942 the pen was further improved by replacing the piston cork with one made of a synthetic material normally used as a sealing agent to prevent home water leaks. Towards the end of its life the filling system was further improved with a new piston and piston rod. Over the span of its production, the 100N came in a wide range of finishes – black caps with black, green and grey marbled barrels and 14ct gold bands, tortoise shell and lizard finishes known as the 101N, mother-of-pearl, all white rolled gold or 14ct pens and, of course, the familiar Toledo. The production of the 100N series ended in 1954. I have received a number of requests/questions to post pics, etc. of my fountain pen collection. 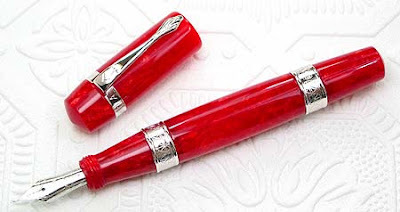 To be honest, it would take too long to do in one sitting, so I thought I might do a number of short, quick hits covering my collection from A – Z.
Let’s begin at the beginning …my initial thought for A was Aurora – but not so fast, I have a red Ancora Perla fountain pen with a medium nib. First a few pics, then some details. According to Stylus Magazine, “The Ancora pen company was founded on the shores of Lake Maggiore, Italy, in the early part of the twentieth century. Giuseppe Zanini received his first fountain pen as a gift, and fountain pens became his gift to the world with the inception of the Ancora pen company at Sesto Calende in 1919. His earliest wish was simply to make beautiful pens, but his long-range desire was to create every piece of every Ancora pen in his own factory. 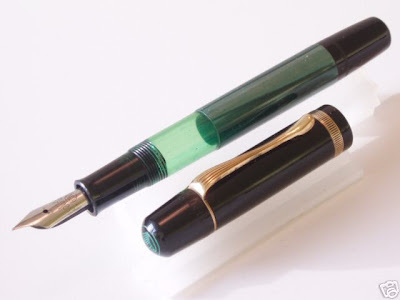 Zanini’s untimely death in 1929 bequeathed the fruition of this dream to his son Alfredo, and within a year, all parts of the company’s ebonite and celluloid button-filled pens were produced within the Ancora factory. Eighty-five years later, Giovanni Santini is fulfilling the original mission of the brand: to produce exquisite pens with passion and care and share them with those who appreciate the timeless fervor that created them. Santini collects vintage pens and owned a pen shop in Turin for a number of years. But it was his work as a pen repairman that gave him the initial impetus to make his own writing instruments. Ancora has employed an exclusive resin in order to reproduce the richness and iridescence of the pearls of the south seas – not surprisingly “Perla” is the Italian word for “pearl”. The pictures speak for themselves, the colour of my pen is a gorgeous, bright red with a wonderful marble effect -quite amazing indeed! The material is exceptionally light. As seen in the pictures, the pen has two large sterling silver bands with an interesting wagon-wheel like design on them. The cap band is engraved with the words “Ancora Italia” and the clip has an anchor symbol on it – in case you haven’t figured out the naming pattern yet, “Ancora” is the Italian word for “anchor”. When capped, the pen is just under 14 cm (5 1/2 in.). When posted, 16 cm (6 1/2 in.). The only potential problem with this pen is that it will not stay posted – I say potential because the pen is large enough for me that I do not need to post it, others may feel differently. The diameter of the pen varies from 10mm at the ends to 15 mm at the widest part of the barrel (3/8 – 5/8 in.) and the cap diameter is 15 mm (5/8 in.). Ancora is one of the very few companies that still produces their own nibs. In fact, the whole pen is handmade. I have read in some places that this approach has created some quality control problems – variances (a bad word to QC people!) in the quality of the pens and nibs. Some writers even suggested that you always write with your Ancora before you buy it (rather than purchase over the internet, for example) to make sure the nib is okay. Well, I purchased mine from a reliable Pentracer so I was able to check on the nib quality before I bought the pen (even though I didn’t actually write with it). The nib is 18k with a rhodium plating to match the silver trim. Bottom line, mine writes beautifully – nice flow and the nib has an incredible amount of flex to it (so much so, it took a bit of getting used to it). I think this pen can be had for around US $175 – a great value.